Finding (SIGINT/DF) capabilities for the collection and reporting of DF lines-of-bearing emitter geolocation, net construction, and signal analysis information to support threat command decisions, and optimize the use of threat force assets. The NESTS program consists of a multilevel sophisticated suite of SIGINT/DF capabilities utilized to monitor radio frequency emissions for the purposes of determining direction and geolocation of signals/emitters of interest. The NESTS network provides threat representative Electronic Support (ES) capabilities to the Integrated Threat Force (ITF) to assist in Red Commander decisions. 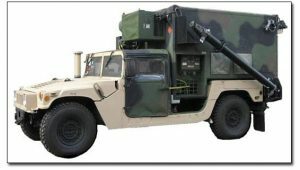 CFI, working with the Prime Contractor, engineered, designed, developed, built and delivered all nine of the HMMWV based platforms/shelters for the program described here. Included were the design of the shelter power systems, power distribution, signal entry, equipment mounting and layout, environmental control, RF and Data distribution and RF output mast design and integration. CFI's contribution during the requirements definition phase was to flow Top Level requirements down to systems and sub-systems and to translate the requirements into a specific hardware configuration. During the design phase, CFI provided research and expertise to improve functionality and performance. In particular, this system required a large amount of equipment to be included in a small, lightweight, self-contained package, while still allowing for usability and sure comfort over extended periods of operation. Life-cycle costs were addressed and reduced by maximum usage of current military technology combined with COTS technology when performance could be improved or maintained while lowering costs. During the Development phase, CFI developed hardware necessary to complete the system for testing and fielding. CFI has deep experience with providing practical, usable, ergonomically designed ground station configurations while meeting or exceeding theoretical performance requirements. CFI maintains a QC program using the AS9100C QMS for all our design, fabrication, and integration projects. CFI also designs and fabricates the subcomponents used in our programs. CFI provided a fully integrated platform for the prime to populate with the required electronics. CFI produced nine units to the limited rate production specified by the program while meeting all QMS and schedule requirements.